Garden Party: a dignified picnic or barbecue but better. It's quieter...and there are rules. Ventured up to Connecticut this weekend for the wedding of my oldest nephew and his beautiful lady. Two beautiful souls joined together and enlarged all of our hearts. It was a wedding infused with their personalities to near capacity level. It couldn't have been more charming. Non-traditional yet all the necessary components were accounted for. Vegan, free-spirited, relaxed, it bears repeating...charming. Just like the bride and groom. 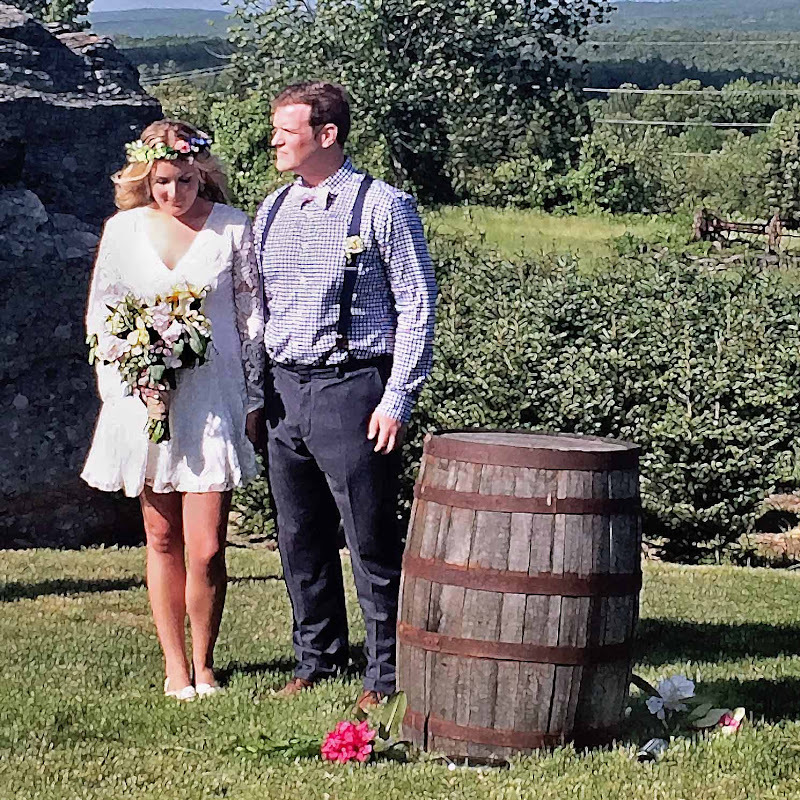 The bride is a native New Englander, and is transplanting herself to Philly to allow her new husband to continue coaching basketball at Swarthmore college. She THINKS we are southerners here in Philly, and that we are friendly in that "southern" kinda way, and that we say "y'all". I told her she was right on all three accounts. Why burst her bubble, she will find out soon enough. I'm just thrilled I will have my nephew AND a new niece living close enough that hopefully we will be able show her that altho the only "southerners" here are those who live in "South Philly", and that we say "youse guys"... we ARE indeed friendly. When we want to be. The wedding was held in a beautiful red barn on a Christmas tree farm. The dress code was deemed "Connecticut Casual". Which was an ongoing debate as to what that entailed. The night before the wedding the bride admitted that "Connecticut Casual" COULD be a big mistake, as not everyone truly understood it's meaning. Seriously folks...all I learned about "Connecticut Casual" I learned from "The Office" television show and Andy "The NardDog" Bernard...Regional Manager of the Dunder Mifflin Paper Company in Scranton, PA. (I'm still in mourning that this television show is no more, and has ironically gone the way of office paper products). Andy Bernard: A few simple reminders. No burping, no slurping, when eating take small bites and chew thoroughly with your mouth closed. This is not a picnic...it's a garden party. Stanley: What is the dress code for this "Garden Party"? Andy Bernard: I'm glad you asked, "Connecticut Casual"
Stanley: Any chance "Connecticut Casual" is like "Pennsylvania Business"? 'Cause THAT is what I'm wearing. Luckily for the bride, it wound up being about as far from "a big mistake" as possible. It was totally and completely THEM. Which made it just perfect. Sounds like it was beautiful. By the look of IG it looks just lovely! Mazal tov to them! Sounds wonderful. I miss that show as well - always witty. I love a charming wedding. Your instagram photos were stunning! What a gorgeous wedding and VEGAN? Woah!! Love it!! I love the bride's dress. I miss The Office too..so so much! Fun post, Kathy. Thanks for sharing your family life events. From what you shared on IG it looks like the most perfectly sweet wedding! I love those simple and sweet details! Haha! I would totally have to google Connecticut Casual. Looks like a beautiful wedding! What a beautiufl couple! Congrats to them. So glad you'll have a niece around too. I gained one of those with my oldest nephew last summer. They're pretty awesome to have. So glad they had such a perfect day!! Awww, many happy regards to the couple!